ARCO, a leading UK safety expert, says it is urging businesses to do more to protect employees against the dangers of the sun this summer, following a recent survey that suggested only 5% of workers receive UV protection from their employers. Following the survey, commissioned by Deb, Arco says it has launched its annual sun protection campaign, to educate employers about the danger of UV rays and the steps they can take to protect outdoor workers, including providing appropriate sun cream. Arco says although UV rays are extremely damaging to the skin and can cause a manner of health problems, the risks facing those who work outdoors are often overlooked. Noise-induced hearing loss continues to be a major issue for many industries across the globe. In the UK alone, research estimates that over 1 million people are exposed to noise levels at work that may be harmful. Some 17,000 people in the UK suffer deafness, tinnitus or other hearing deficiencies caused by excessive noise at work. As such increasingly stringent noise at work noise and environmental noise legislation regulations have been put into place. PWE reports. 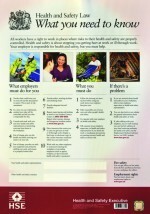 The HSE has commissioned a re-design of the Health and Safety Law poster and leaflet in a range of formats as part of its commitment to make health and safety information more accessible.